Do your dogs love treats? Be sure to check out the fun review on Miss Molly Says for Jones Natural Treats. Mom Does Reviews has one HERE also! A big Thank You to our Grand Prize Sponsor- Jones Natural Treats! One lucky reader will win a HUGE Treat box, tailored to the size of your Pup! This Blog Hop is for fun prizes or Gift Cards for our furry friends. 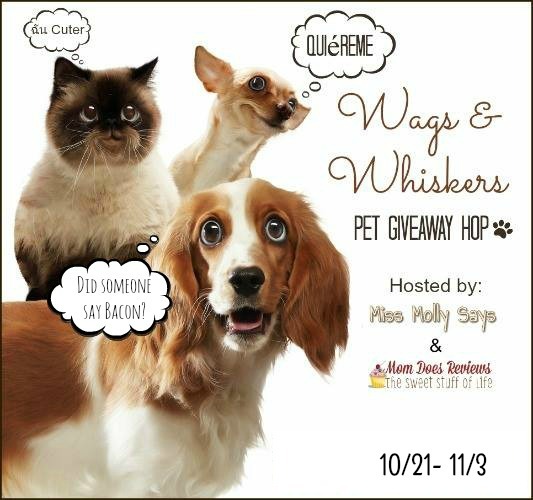 You could win a cute dog sweater, cat treats, toys, bones, gift cards and CASH! Tammie’s Reviews, Giveaways and More is sponsoring a $25 Amazon or Walmart Gift Card to one lucky reader. Winners Choice! Open to the U.S. only. Previous post: Kids Academy Apps Updated + Printable Worksheets! My friend’s cat likes to play with a squeaky mouse because it’s so entertaining. A pair of my shoes seem to be her “toy” of choice. Thank You for the giveaway…our dog loves playing with tennis ball i.e. fetching them, occasionally popping them ! Elvis is my 5 yr old Mini Pincher and he has a frog with no stuffing, because Winnie my older dog tore out all of the stuffing out of it. Elvis carries the baby everywhere with him, he sleeps with it and if we take a nap he brings it to bed with us. Winnie has many toys, no favorites, and she tears the stuffing out of all of them. Our cats love to chase a laser beam dot. They do so until they are worn out! Stormy likes to play with bouncy balls, squeeky toys, and the cat. My cats like anything on a string! My dog Angel loves her alligator. He squeaks but only at a pitch she can hear so it is my favorite of her toys too. The dogs like to play with balls and ropes. Paper bags are a favorite play toy for my cats. My puppy loves her Pink Kong elephant squeaky toy. I have no idea why she likes that one the best out of all her toys! Strider loves playing catch with his frisbee and gets so excited! Nikko is more independent so he loves to play with a kickaroo today. Mushu on the other hand enjoys interaction like the dangling toys on a stick. The cats love to play with things around the house like bugs and toilet paper and boxes. Little balls that they can bat around. Or toys on a string. My 13 year old Yorkie isn’t as playful as she used to be but she loves anything she can chew on. My cat likes playing with a long pink string but I am not sure why. She just does. My cat’s favorite toy is anything crinkly! He loves playing with tennis balls but he does not get to get them too often because he will eat them. My cats love to play in paper grocery sacks and they have some catnip filled toys they love. My cats also like to play with wine corks. My cats are fairly typical in that they really like the plain household things like the empty boxes and wadded up paper but they also like the catnip toys and the foil balls. my dog loves to play with a chew toy that looks like a bone and squeaks when she bites on it. My cat likes to play with anything she can bat, flip or slide across the floor. Today it’s a nylon twistie pretzel toy. My cats love soft little balls to bat around. My dog loves her Kong. I fill it with Peanut butter and dog treats and it’s rewarding for her. My cats love to play in boxes because it gives them somewhere to hide. My dog does play with some typical toys. Her favorite “toy” is socks – she loves if she gets hold of someones socks. She doesn’t chew them, just runs around with them like a crazy dog. My dog doesn’t really play a lot with toys but sometimes she plays with a doll I made her. My dog Harley loves tennis balls, we have to put them away or he’ll tire himself out! Our pit loves to tug, so we play with the rope mostly. He likes his bone because he has something hard to chew and loves the marrow. My cat loves bath brushes, both black cats (Durn and Kimmie) will brush themselves with them. My cats like to play with a sock that I have filled with catnip. It drives them nuts! My cats like to bat balls around the house. His favorite toy is a pillow he carries it around with him everywhere and he uses it like a pacifier so I think it comforting to him. My cat likes to play with a small bolt she found because she can make it slide and spin. My cats really love empty boxes and those foil crinkle balls. But wadded paper works too! My cats love anything on a string! My bunny likes to chew on wooden blocks. Sometimes my cat likes playing with a plastic water bottle cap because she can send it flying across the floor. My cats have a fishing pole with a mouse on the line that they really like to play with. My cat’s favorite toy to play with is a little ball because she likes to chase it around! He has a turtle that he got in a subscription box that is his favorite right now, I can’t believe he hasn’t destroyed it yet. My cats like to play with their catnip mice. Today my cat was playing with the recharging cord to my iPod. She liked batting it with her paw. My cats like soft balls and anything on a string. Quite honestly, after buying lots of toys, we’ve found that the pets love things like paper bags and plastic milk jug tops the best! They live for their treats though! Little Bit loves bottle caps and twist ties. She is odd. My favorite pet is my wonderful dog Cody and he loves tennis balls. He is particular though and only wants the original green tennis balls. He loves to fetch and play keep away. My cat really likes a large pink string, but I am not sure why. She just does. My dog has a toy we call big blue that he got right after hip surgery 6 years ago. It is a bounce toy that he has loved since day one. While it may look a lot worse for the wear now, still one of his favorites! Another toy my cat likes is an aluminum foil ball because she can send it flying across the room. My dogs like playing tug of war with his favorite rope. My cat Frankie loves a little goose toy that was Pippi’s, our dog. Most of the plush on little goose is gone from where Frankie has loved it to pieces. He brings it upstairs every night. While bringing it upstairs he sings his Little Goose song. It is a specific song that he only sings when carrying Little Goose. My dog loves to play with this red and blue toy bone. He mourns when we put it up high because it is time to go to bed. Today my cat was flipping and chasing a plastic straw. My dog loves balls that bounce and bones he can chew up. Little Bit also likes to play with plastic bottle caps. She has real toys BTW. They like batting around soft balls. they dont care for hard ones. My kitty, Lois loves any toy with catnip! My cat has this small stuffed dog that she carries around. I think it is an old happy meal toy from 10 years ago. Our favorite animal is a dog name Snoopy and her favorite toy is a snake that she carries around all the time. She likes it because she can drag it all over and it is easy to hold for her. My dog loves to play with this big lime green squeaky football. She picked it out at PetsMart last year for her birthday and has played with it every day since! She plays with it by herself, brings it to you for fetch, and even sleeps with her head on it! My cats favorite toy is a cardboard box. She jumps in and out of it, and uses it as a scratching post. It entertains her for quite a while. My kitty, Lois also loves to play with her krinkle ball. She loves all toys, but she has a squeaky pig she really likes! My dog’s favorite toy is toilet paper. She waits until I’m asleep at night, then goes into the bathroom, grabs one end of the toilet paper and quietly teepees my house. Our cats’ favorite toys are Qtips, bread ties, blush brushes, shave brush, and bugs. My cat also likes to play with wire ties because she can flip them and chase them. My pet’s favorite toy is her blanket. She loves to sleep. I dog has a round tube with a hole in the middle she loves to play tug with. She actually will try to tug with every toy, even rubber bones. It’s her favorite game. Buddy loves anything with a squeaker!!! My cats love chasing around a laser dot. The cats love their laser light. Jay really loves to chase after his chuck it ball and chew on his kong extreme. thankfully they last a little while before I need to replace! My dog’s favorite toy is her treat ball. She is a typical beagle and is totally food motivated. She enjoys it when I put her meals in her treatball. Almost every other living thing 8n the house doesn’t enjoy it though. That 20 lb dog will roll an adult in her way…LoL! Our Bella has a tub full of toys but she would rather play with a plastic hanger. She sneaks into the girls’ room to see if they threw any on the floor. She than runs out and chews it up. Thank you!! My cat’s favorite toy is a catnip fish. She likes the catnip smell. My cats love cardboard boxes and these little knitted blankets they got to keep from the shelter. They drag the boxes and blankets around so they have things to hide behind when they are chasing each other through the house. My cat likes to play with twist ties. Why IDK she is odd. Our lab LOVES his squeaky pig toy…I think because he thinks it is squealing. My dog really likes the bone from a shank steak we bought ages ago. She destroys real toys, but that bone’s lasted months and months, haha. There’s an antler she’s got, too. There is one ball she loves to play with that she somehow hasn’t destroyed – big surprise. She’s astonishingly gentle with it. But she likes the bones a little better. Still, she’ll bring the ball for fetch every few days and I’m always surprised it’s not busted yet. My dog has an old collar that is her favorite toy. I have no idea why she has adopted that but its her favorite thing. Shadow, our cat, has a small ratty mouse that we fill with cat nip. He’s had it for a number of years and even when he gets new toys, he ends up going back to this mouse. In the middle of the night, you’ll hear him carrying the mouse in his mouth and crying out at the same time. She has a little pillow filled with catnip that Lois, my kitty, loves, Loves, LOVES!!! I don’t have any pets at the moment but I had a Chow that liked to play with a tennis ball. His favorite thing to do was to push it under the furniture and make me pull the furniture out to get to it! I really think that he just enjoyed watching me do that! One of my dogs has a favorite stuffed toy that he pays with daily! It has a squeaky! My dog has a squeaky reindeer toy she loves. I think the noise makes it fun for her. Baby lives really big rawhide bones to chew on. She just really likes to gnaw on them for hours at a time, maybe she’s dreaming of a huge chunk of meat.